It looks as though not much has changed the last time I wrote. The swimmers got a few loops of thread and I'm officially content with how this little treasure box looks like. The sun has begun to flood our home now that it's climbing high enough to conquer the rooftops that blocked it for what seemed like an eternity (every winter feels like an eternity, even the one we just had that was shorter than any I can remember). you'll get a very special -30% discount of your entire order no matter how big or small (shipping excluded, sorry!) by entering the coupon code HAPPY30 at the checkout. Six new books available in my shop. Also, a variety of long-stitch notebooks from 6-13€ individually or in sets of 2. I'll post about them later in the week, too. I know many people (myself included) hate how most mass produced notebooks have such stiff spines you have to force them to stay open, and still there's the awkward area you're unable to use. Handmade books (if done right) are naturally much more user-friendly to begin with, still, I wanted to go even further and make a book that allows you to scribble notes super smoothly over the entire page surface. Coptic bound books are a dream when it comes to a book opening flat but they're not for everyone, so I wanted to experiment with the basic case bound style. These differ a bit structurally from my usual style of case bound books. I've left out everything from the spine of the book block I deemed possible, leaving just a some lightweight linen fabric to support the sewing and hinge area. The spine is much more flexible and still solid enough for books this small. The covers are also slightly thinner than usually, so these are lighter as well. These are easy books: easy to take with you because of their size and weight, and, most importantly, easy to use. It seems every now and then I need to rant a bit about quality and awareness and all that. Sorry about that. It's just that lately I've had one encounter too many with someone claiming to be a bookbinder with nothing to support that claim. It's the same with cutting your friend's hair with your utility scissors - it does not turn you into a hairdresser. Knowing how to make a book does not a bookbinder make. 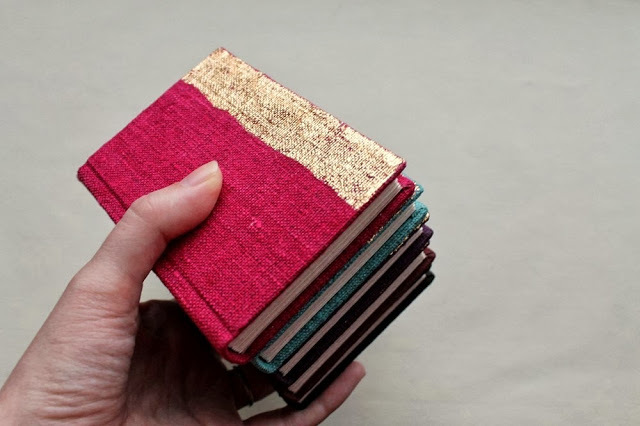 I don't care about titles or formal education but I care about the books and I care about what sort of image they give to the general public about bookbinders and their work. Maybe it's different out in the big world; here where bookbinding is such a rare profession all publicity counts, and this is one time when all publicity is not good publicity. I wish I had enough faith to believe that people know better, that they recognize quality when they see it (or maybe they do, they just don't recognize the lack of quality as easily). I'm not worried about someone without talent taking my customers; I'm worried that people don't know what handmade books are supposed to look like, how they're supposed to function and not fall apart. You may think you've seen something like this before, and that's because you probably have, last October. That gold&gray book sold very quickly and it was one of those books I was sort of sad to see it go while still feeling exhilarated to have my work put to good use by some special person far away, so my random gilding experiments were always something that needed to be revisited. And here's the result. I was really tempted to post loads more photos of these darlings, but because it's impractical for many, I'm hoping you'll visit my Etsy shop for more photos and details. I also tested copper leaf on the purple and olive fabrics, but the metallic surface was too clean, cold and just somehow off, so I ended up with a learning experience. Maybe it's time to study different patina options to get the results I was hoping for. I really liked the brushed gold surface I did on the pink journal, so even that might be just the technique that saves the copper from looking too sterile. I feel like ignoring it's August already. As I've said many times before, I'm not a summer person (I'm not a person of any season), but this isn't about the weather; it's about time passing. I'd be fine with it if time took a break for a while. I've never really understood how time works, how it is possible for me to be 29, how I always end up losing time. Must have something to do with how great I am at killing time. Two more large books with rounding and backing. Next I'm making Coptic bound books for a change. Back to normality, I guess. I finished updating my shop just as it got too hot to work on the balcony. If I were a morning person, I'd probably have much longer workdays. Now I just have a lot of time.